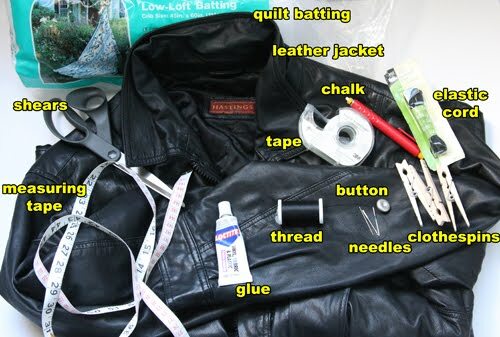 As you may recall from a previous project I posted, we still have the rest of the thrifted leather jacket leftover to something fantastic with! 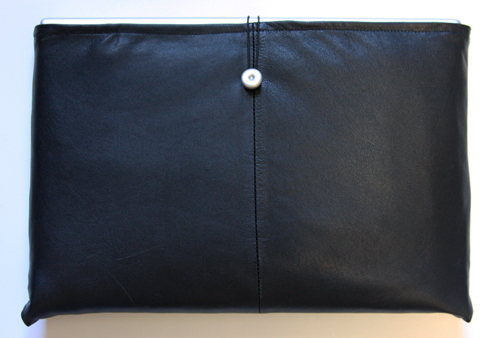 So with my Hubby’s birthday quickly approaching, I decided to make him a homemade sleeve for his laptop computer. 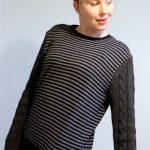 Sure you can buy one from the store – and I did scrounge up a tutorial for using some neoprene from an old wetsuit [and here, too!] (like I have many of those laying around! 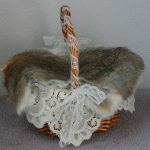 )…but I wanted to try a different material. Leather is cushioning and sleek – but if you prefer manmade leather or vinyl (or even fabric, corderuoy, or denim!) this project will work just as well. 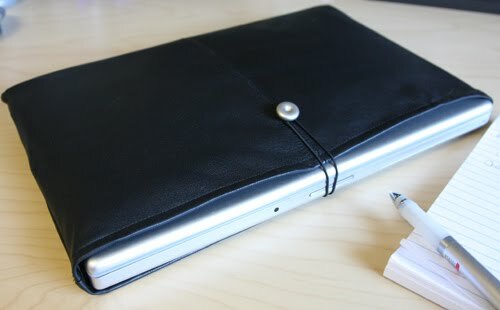 I was inspired by those wraparound manila envelopes – but you can always use a strip of material and velcro as a closure, or fashion a long strip with a parachute buckle around the entire laptop, or extend one side of the outer material and use it as a closure flap, or even add a couple inches to each end and use a zipper as closure, turning this sleeve into a simple zippered bag. The possibilities are endless! 1. 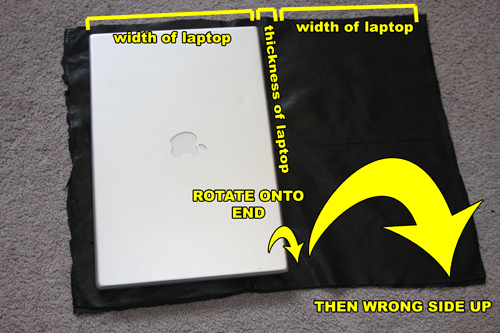 Place laptop on your sleeve material, right side up, front edge facing away from you. 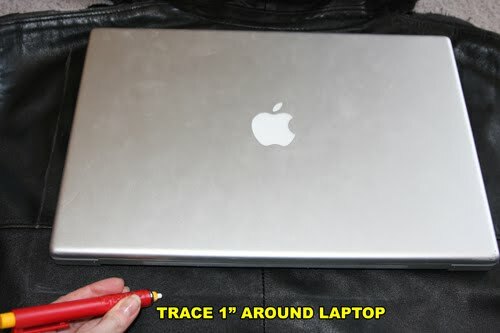 Trace around laptop on all sides, adding 1″. 3. 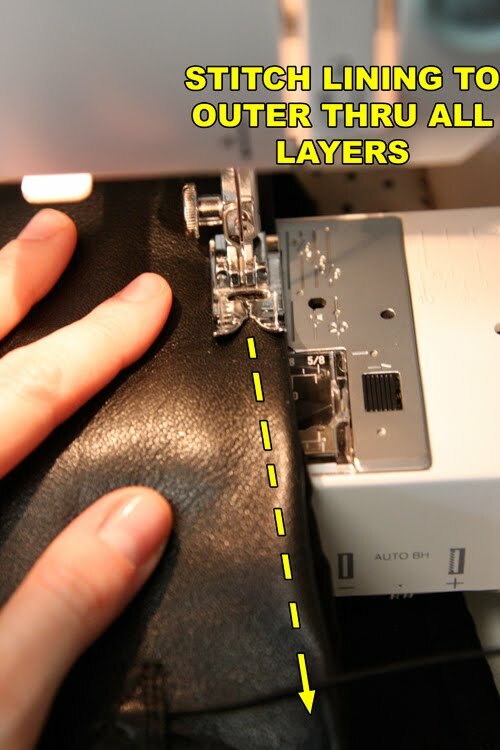 Cut the rectangle out of the material (cutting through both outer and lining if you are using a jacket), using leather shears. 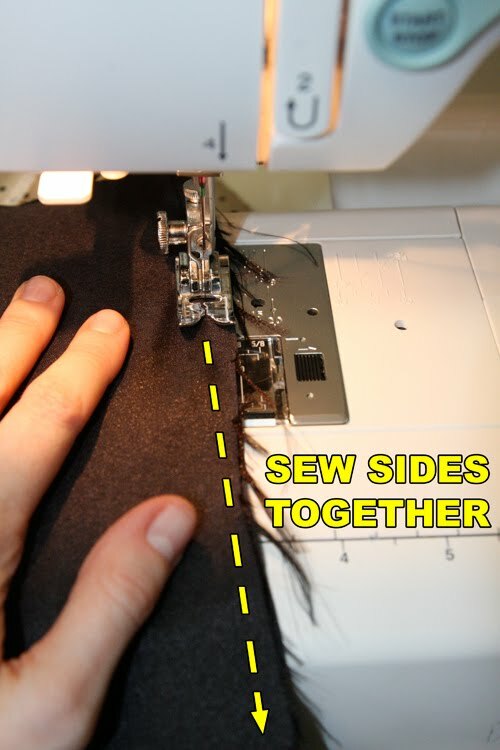 If you do not have a lining, place this rectangle on top of your lining material, trace around, and cut using fabric scissors. 4. 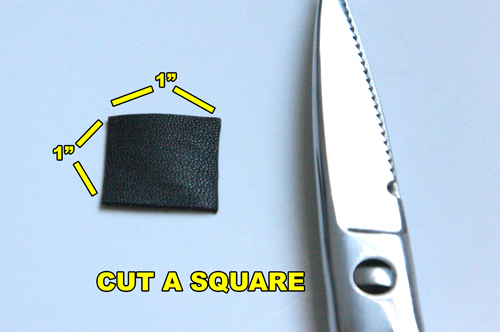 Cut a small piece of leather about 1″ square. 5. Unroll batting from package, and leave it doubled up as you flatten it out. Place rectangle of material on top of the batting. 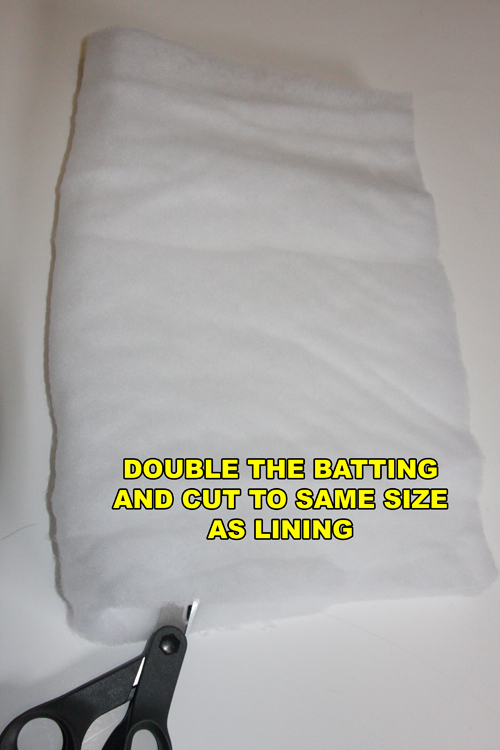 Cut a piece of batting the same size as the lining, then trim batting about 1/2″ on the sides only. 7. 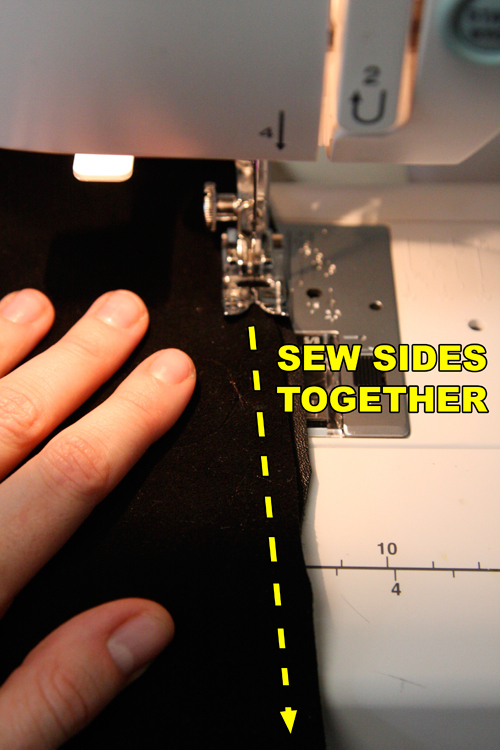 Fold lining rectangle in half, and machine-stitch the edges together, using a needle for wovens and regular thread. 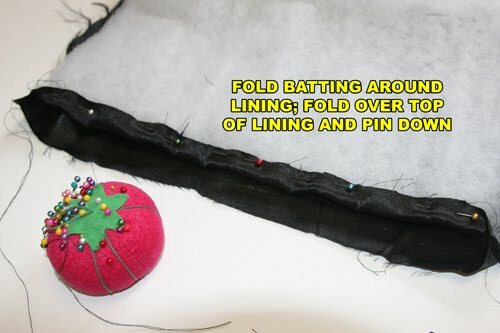 This will make the lining into a “pouch.” Do not turn right side out; the right side needs to remain on the inside. 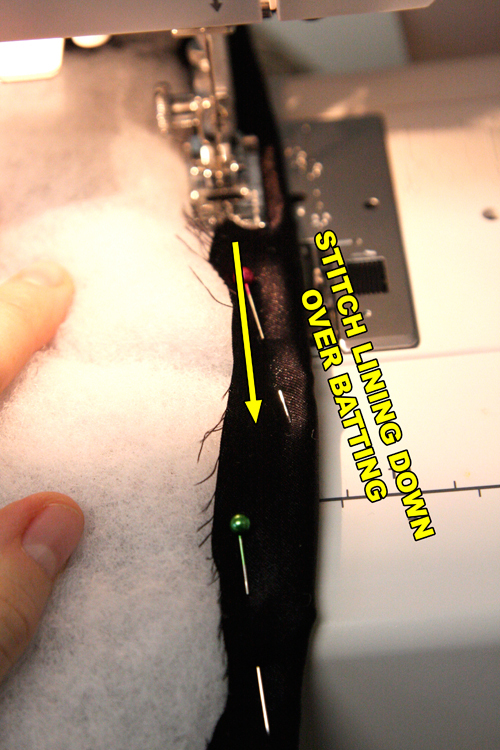 Machine-stitch the lining edges down over the batting, at about a 3/8″ hem. 9. 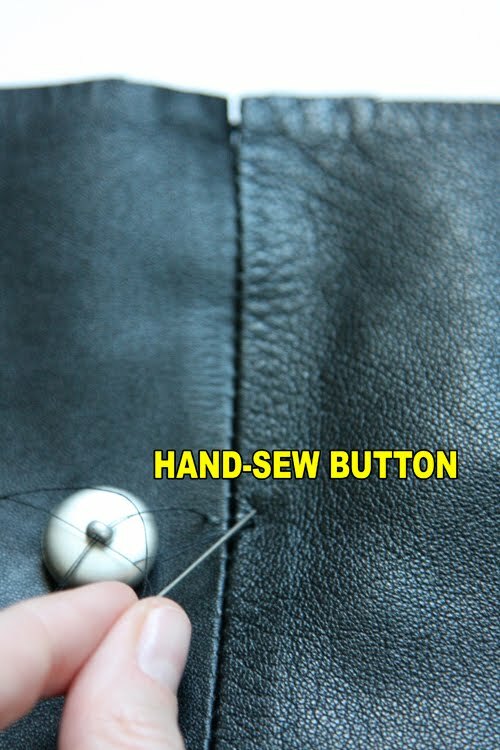 Sew button to the material pouch you made in Step 6), about 2″ down from the top edge on the front of the pouch. 10. 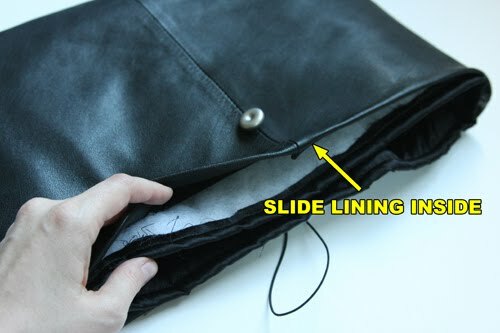 Slide the lining into the material pouch, and slip the laptop inside to check for sizing. 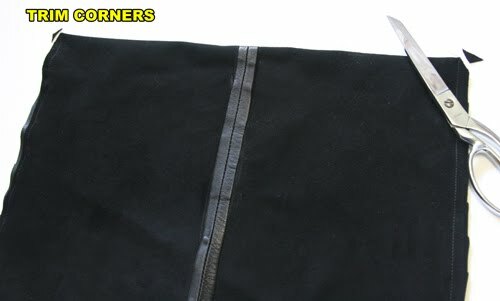 On the back side of the material pouch, tape one end of the elastic cord to the center, about 2″ down from the top edge. 11. 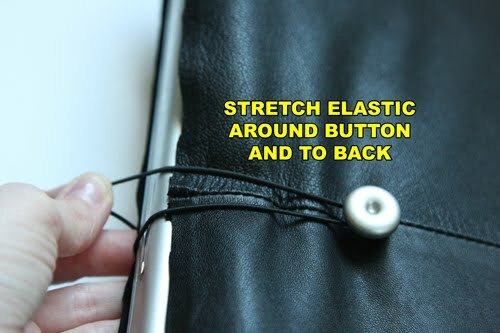 Wrap elastic cord around button, and bring the other end to the back, cutting it and gluing it down next to the other end. 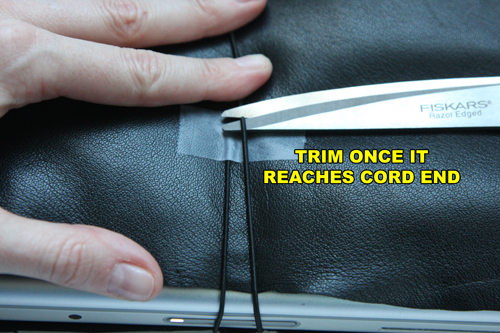 Make sure the cord is taut around the button and will keep the laptop from falling out. 12. 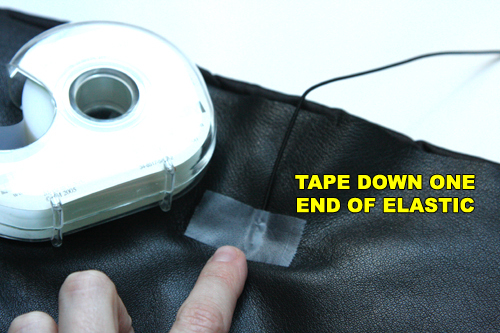 Trim the cord to meet the taped-down end. 13. Re-tape cords down with the ends free. 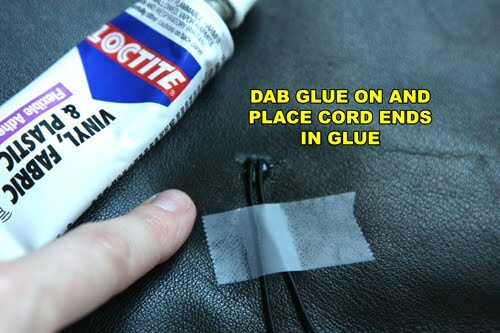 Place a dab of glue under the ends and press them into it. 13. 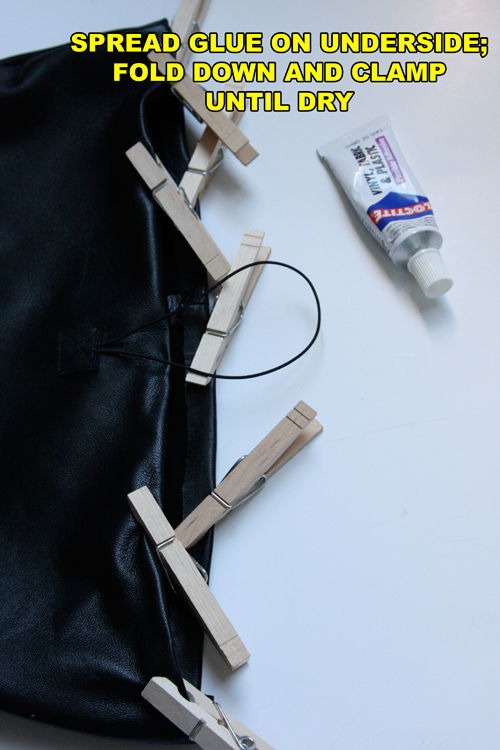 Remove tape and glue the small square over the ends of the cords. 14. 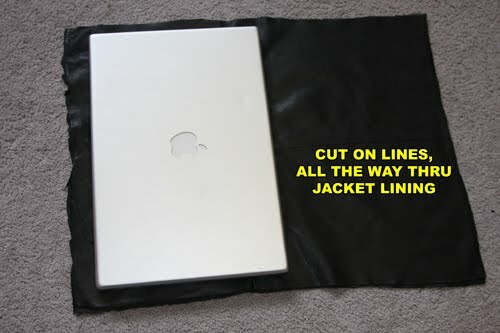 Remove laptop and lining from the material pouch, and machine-sew the square over the elastic cord ends, first sewing a square around the edge, then an “X” shape in the center. 14. 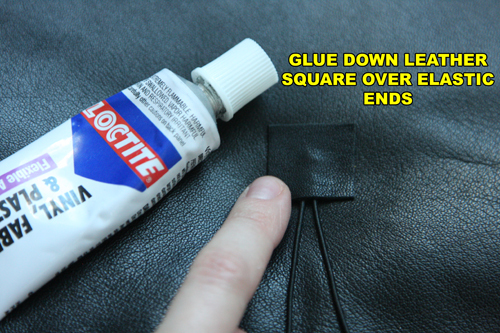 Spread glue on the inside of the outer pouch, close to the top edge. Turn down top edge about 3/8″; clamp until dry. 15. 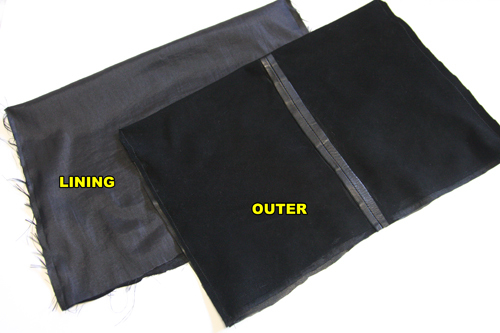 Slip the lining back inside the outer pouch, pushing the corners all the way in. 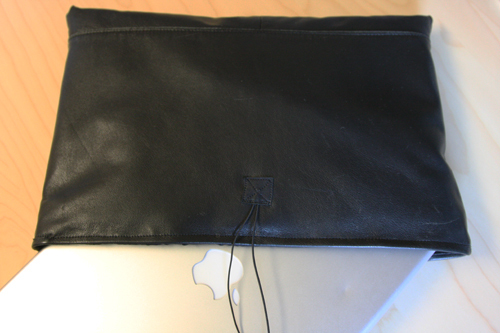 Stitch around upper edge of laptop sleeve to secure the lining to the outer material, using a needle for leather and upholstery thread. Happy DIY’ing and Happy Birthday, Hub! This is my last post for Threadbanger – wish I could do more! Hasta la vista, TB! This looks way better than my blue sleeve. Good thinking! Looks great!! My DesignIY project for july is a new Persona bracelet (http://www.personaworld.com). 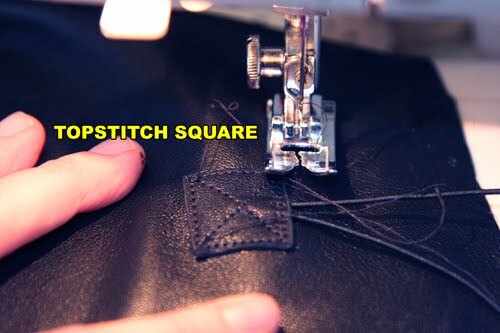 Love the detailing on the topstitch square btw!! wow I love it!! I love your blog!! WoW, What an idea!! I really amazed how you can make this #Carly!! Thanks for sharing.I Wish I could make this.Coz,it’s really hard to cut my jacket.I love my jackets. 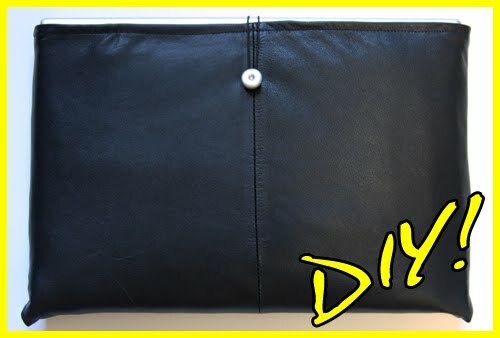 Do you have any alternative Idea which helps me to make a laptop bag?? Sure, I totally hear you Linda! It was easy for me to cut up this jacket because it was unwearable but I wanted to repurpose the fabric. 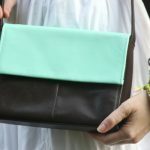 You could just repurpose fabric or leather you have from elsewhere: a tote bag, an old quilt or comforter, or even purchase some fabric from the fabric store. 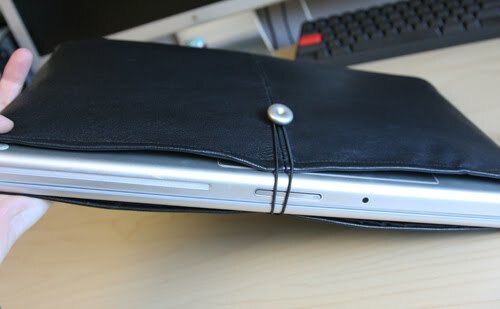 You just need to pad it out with batting and a lining to protect your electronics. Hope that helps!